Continuing with the Somme theme, this is a German snap-shot taken by a soldier in the 26th (Reserve) Division showing British soldiers captured on the Somme in July 1916. It is believed the photograph was taken in the village of Miraumont, which appears to have been a processing area for POWs, and that these were men captured between Thiepval, Beaumont-Hamel and Serre. 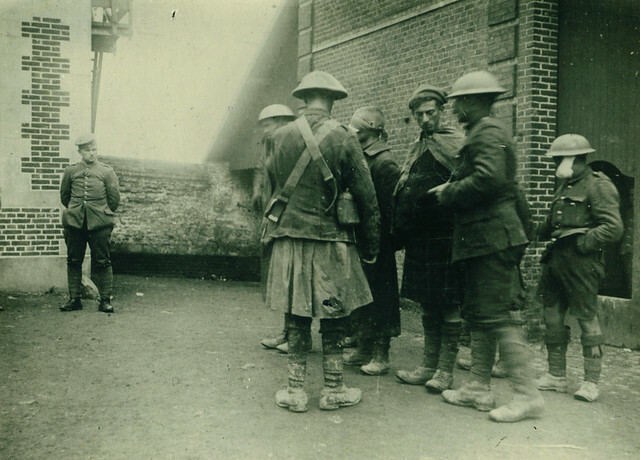 The Scottish Sergeant with his back to the camera seems to be marshalling the men and one man has a shell dressing on his face indicating a battle wound from the recent fighting in which these men were captured. In the early stages of the Somme many soldiers were captured in the German trenches when attacks went wrong, or got cut off in No Man’s Land and were unable to return to their own lines. The 26th (Reserve) Division was a Wurtemburg formation which had been on the Somme front since late 1914. This entry was posted on 28/02/2012 by sommecourt. It was filed under British Army, France, Great War, Somme, Western Front, WW1 and was tagged with 1916, Picardy, POW, Prisoners of War, Somme. This is a great site! I have never seen most of these photos before. Fantastic photos thank you for posting them.